Like many thousands of metro-area homeowners, Robert Goss was laid off by the auto company he worked for and fell behind on his mortgage. The loan was owned by Freddie Mac and serviced by CitiMortgage. Mr. Goss immediately applied to CitiMortgage for a mortgage modification and the bank agreed to a trial modification. For the next 22 months, Mr. Goss made timely payments on the mortgage and separate payments on his taxes and home insurance, even paying extra amounts on the mortgage while awaiting the expected permanent modification. Instead, he discovered that his home had been sold without his knowledge at sheriff’s auction and CitiMortgage had been taking modification payments for five months after the sheriff had taken title. Mr. Goss filed a lawsuit for breach of contract and other legal violations. 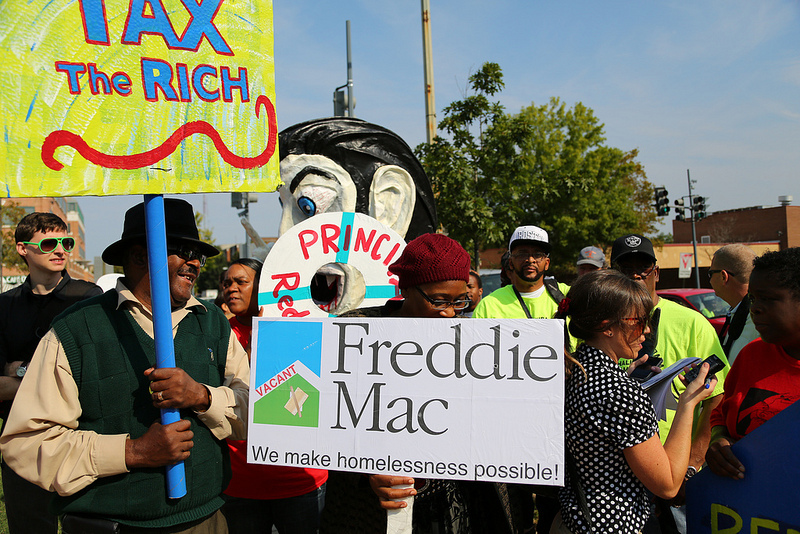 Even though his case is open and pending at the U.S. Sixth Circuit Court of Appeals, Freddie Mac is now trying to evict him in a lower court. Join us in the entrance lobby of the courthouse and we will fill the courtroom in support of Robert Goss. 52nd District Court is located at 520 West Big Beaver, north side of the road, immediately east of I-75 at exit 69.